We will examine, inspect, survey and scrutinise all the fact’s by the best experts and scientist on the planet, the evidence of the greatest relic yet discovered in world history, what was very possibly left behind in the tomb of Jesus owned by Joseph of Arimathaea, and known as the most famous historical object in ancient history, called: The Shroud of Turin, as told in THE GOSPEL OF JOHN 20. What and who is in this book? Nothing But, Facts, Proof, evidence, 100’s of links to Peer Reviewed scientific papers & articles, by the best researchers in the world. 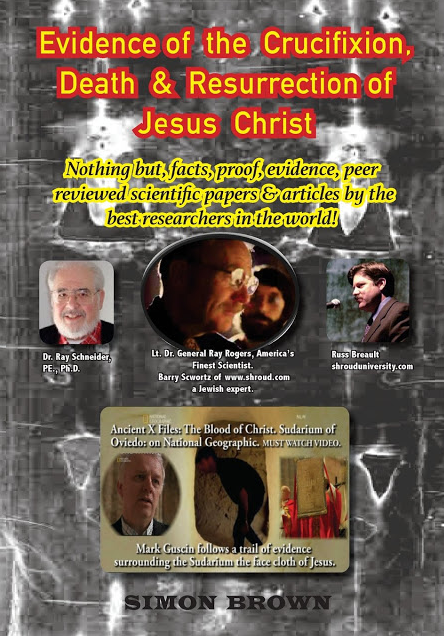 I have added research by Lt. Dr. General Ray Rogers, America’s finest Scientist who was against the Shroud, until his new research converted him. Raymond J. Schneider P.E., Ph.D. Associate Professor Emeritus of Mathematics and Information Technology at Bridgewater College. RUSS BREAULT who has been researching and lecturing on the Shroud of Turin for over 25 years. His presentation makes use of over 150 superb images and unfolds like a CSI investigation. Mr. Breault delivers a dynamic, fast-paced experience. His highly acclaimed presentation is called THE MYSTERY OF THE SHROUD: A Multi-Media Encounter or simply… Shroud Encounter! Ancient languages translator and historian Mark Guscin, B.A. M.Phil., Expert on the ”SUDARIUM” OF JESUS. (Face cloth). This book Includes research by Peter Shumacher, the inventor of the NASA VP-8 Image Analyzer. As Christians we know that our mission is to intercept those who are sadly heading for the Gates of Hell and each one of us need to be aware of the urgency of the hour in saving our ‘neighbour’…. Well, I guess that is one way of putting it. Not my way, exactly. Not very clear … is this book for or against the Shroud? Simon Brown is very pro-Shroud and a strong evangelical at the same time. His view is that the Shroud should be used or promoted in the context of world evangelism. He tends to overstate things but I admire his zeal. Dan, as I pointed out in a thread discussion a while back, NASA did pay for the use of the VP8 in a government contract in which the VP8 was used to help analyze LANDSAT satellite photography. So, it is easy to imagine the common parlance in the industry at the time referring to the machine as “the NASA VP8”. Ref: ntrs.nasa.gov, Technical Report #19760010448. NASA certainly owned the work that resulted from the use of the VP8. The info about NASA was not my own source. And if it is incorrect it will be remmoved. On February 19th 1976 the unique Three Dimensional properties of the Shroud were discovered by Dr John Jackson, Dr Eric Jumper Rev Dr. Kenneth Stevenson, Giles Charter and Peter Shumacher of the Colorado USAF STURP team, using a VP8 NASA 3 dimensional computer designed for NASA and the Gemini space project. The experiment was performed at Albuquerque, New Mexico. The VP8 Image Analysing Computer was originally designed to create a three dimensional image of serial images, and used for military purposes. NASA was interested in images taken by satellite, of the reverse side of the moon. The image formed on the VP-8 Image Analysing Computer are created by computer analysis of serial photographs taken by an orbiting satellite. The images are formed by the computer processing of multiple images normally taken, in this case, by a space telescope. Multiple images of the moon taken by a space telescope can be processed by the VP8 computer, and a three dimensional image of the moon computed and displayed on a computer monitor. And the info on Raymond Rogers was not made up by myself. Raymond N. Rogers (1927–2005) was an American chemist who was considered a leading expert in thermal analysis. To the general public, however, he was best known for his work on the Shroud of Turin. Rogers was born in Albuquerque, New Mexico. At the University of Arizona he studied chemistry receiving a BS in 1950. From 1951 to 1988 he was an explosives research expert and thermal analyst with the Los Alamos Scientific Laboratory (later called Los Alamos National Laboratory or LANL). From 1987 until 1992 he served on the Department of the Air Force Scientific Advisory Board with the equivalent rank of ‘Lt. General’ and received a Distinguished Service Award. He received other awards and recognitions from LANL and many professional organizations. He was granted a sabbatical in 1968 to pursue post-graduate studies in archaeology. The following article is reprinted from NASA’s Jet Propulsion Laboratory’s house magazine, “JPL Universe,” dated July 5, 1977. The controversial shroud is a 4 1/2 meter, 7.62 centimeter long linen cloth that bears a remarkably detailed image of a bearded, long-haired man, with numerous lacerations over his body. Tradition, dating back to at least 1354 A.D., has it that the fabric, with its brownish, stain-like shadings, is the burial shroud of Jesus Christ. Enshrined in the northern Italian city of Turin since 1578, the shroud has inspired widespread curiosity, especially since the first photographs of it taken in 1898 showed the markings to be a “negative” rather than a “positive” image. The resulting “picture” resembles rubbings made from base-relief art works. Was the body image formed from ammonia vapors absorbed into the linen threads, as thought in earlier years? Was it caused by a radiation phenomenon, as one analysis has indicated, or by processes of which scientists are still unaware? Are the dark spots at the wrists and feet direct-contact blood stains? Is the image possibly a “picture” that was painted on? And how could investigators better distinguish between the original image and blemishes such as holes, wrinkles, and burns, scorching and water stains that damaged the cloth during a fire in the Sainte Chapelle in Chamery in 1532? The challenge for Lynn and Lorre was in the first phase a technical one, yet both men became caught up in the age-old mystery, and agreed to see what they could do. Their task was to remove as many of the extraneous markings or “artifacts” as possible in an attempt to reveal a more distinct picture of the figure on the shroud. The pictures they produced (using mathematical and contrast enhancement techniques) revealed a noticeably clearer image of the figure. Both men were so optimistic about the mysteries they might eventually solve if allowed to obtain better photographs, that they chose to present their work to the Holy Shroud Conference in Albuquerque last March. The Albuquerque gathering consisted of 40 participants, including forensic specialists, clergy, scientists from the Air Force Academy, Sandia Laboratory, and the nearby Los Alamos Scientific Laboratory, and eminent Protestant and Catholic scholars, including Vatican representatives. Their common objective was to share current studies on the relic and to prepare for greater scientific examination of the garment at an unprecedented exhibition of the shroud in Turin in 1978. The Face of Jesus?‹Enlargement of the face of the figure imprinted on the “Shroud of Turin” by image enhancement techniques used at NASA’s JPL shows white spots, thought to be bloodstains, on hair and forehead. That exhibition could be the “moment of truth” for the shroud’s authenticity, according to Anglican scholar John A. T. Robinson of Trinity College, Cambridge, especially if use of the destructive carbon-14 dating process (now successful when applied to fragments as small as a square centimeter) is permitted on the fragile fabric. A report by Dr. John Jackson and Dr. Eric Jumper of the Air Force Academy showed that the figure discernible on the shroud probably was that of a man 5′ 10″ tall, weighing about 175 pounds. These scientists ultimately hope to produce a three-dimensional statue of the body imprint. One unusual examination by Zurich criminologist Max Frie, indicated that pollen particles found on shroud fibers are indigenous to Palestine, Turkey, France, and Turin, at dates appropriate to the alleged history of the shroud. Despite the many tests made, scientists at the conference emphasized that they still are at a loss to explain how the image got on the shroud. That is why Lynn and Lorre want to pursue this project. They’d like to apply color classification analysis such as is used routinely on Earth-orbiting satellite pictures. “To separate the various markings and determine their nature,” says Lorre, “we would need to take high resolution photographs of the shroud in many colors, with adequate calibration controls to allow intercomparison between the photographs. Because of their professional and personal curiosity, Lynn and Lorre are hoping to participate in a more detailed examination and analysis of the shroud before the planned public exposition in Turin in 1978. The Shroud of Turin, that ancient burial cloth mysteriously imprinted with a figure thought to resemble Jesus Christ, is dramatically affecting the lives of two JPL scientists. When Don Lynn and Jean Lorre agreed to apply image processing techniques to photographs of the shroud in 1977, they hardly expected to find their results published in newspapers and magazines around the world. Since then, their initial mild curiosity about the relic has intensified through involvement with other American scientists who propose to determine how the shroud was imprinted through a variety of sophisticated tests. The result is that Lynn and Lorre will go to Turin, Italy, in October when Catholic authorities will allow the American science team to make an unprecedented 24-hour examination of the shroud itself. The team is sponsored by the New York-based Holy Shroud Guild of America. And the tests coincide with a public exhibition and international conference about the shroud, to be held in Turin September 26 through October 8. Lynn and Lorre will take infrared and ultraviolet photographs as well as conventional black and white and color pictures. Other team members will make radiographic and X-ray fluorescence examinations. Primarily, they will explore the mechanical formation of the unique “negative” image of a 5-foot-10 man with lacerations about his head, face and body. Turin authorities declined to accept the proposed age-dating tests until it is determined exactly how much cloth is needed to get accurate results. If approval is granted by the conclusion of the exhibition, results from those tests will take months to obtain. Although the shroud has been stitched to a protective cloth backing, the reverse side of the fragile fabric will be examined also, by using a flexible optical instrument. A special frame from which the fabric will be suspended with magnets has been designed by Tom D’Muhala, president of an international nuclear decontamination firm in Connecticut. D’Muhala’s chance reading of a book about the shroud led him to build and donate this equipment and to supervise logistics of the team’s trip to Europe. A formal proposal for the examinations was sent to authorities in Turin, along with a model of the frame and a unique three-dimensional model of the shroud figure, derived from image enhancement photographs. Based on the relationship between image intensity (shades from black to white) and cloth-body distance, Air Force Academy professors and students built a cardboard model of the shroud’s figure. They used slices of l/8-inch-thick cardboard to build up layers (similar in appearance to a topographical map) that form the frontal image of a 5-foot-10 man in a state of repose. The cooperation of major business corporations has been tremendous, Lynn reports. Photographic and electronic equipment companies, including Polaroid, Kodak and the Brooks Institute of Photography have agreed to lend or donate facilities and equipment for the tests. All the participants are donating their time, but money is needed for purchasing some equipment and for transporting people and equipment to Turin. Funds also are needed for the months, possibly years, needed to analyze the data. Lynn and Lorre expect to provide a “quick look” report of their findings soon after the Turin exhibition. Both men speak of the event with expectation, still in awe of witnessing how technology is unlocking closed doors of history. I’m not sure of the original source of Simon’s quote above, but I hope he’ll forgive me if I say that I don’t think any of it is true. The VP-8 was not designed for military purposes, nor does it analyse series of pictures or multiple images. The colours of photographs of the moon are not related to the elevation of its landscape but to the chemistry of its geology. No three dimensional image of the moon can be computed by a VP-8 Analyser from photographs taken by space telescopes, and I don’t believe ever have been. There are various posts on this site exploring the original purposes of the VP-8, of which looking at X-rays seems the most sensible, although, as Nabber has pointed out it was also used by Woodward-Clyde Consultants, as part of a program sponsored by NASA, to carry out investigations of aerial photos, to see if rocky outcrops in areas of heavy vegetation could be better identified by visualising them in 3D. Pete Schumacher’s site, shroudnm.com, has some original brochures, and a fascinating lecture by Schumacher on the VP-8 and his involvement with it. Only 150 or so VP-8s were made, and information about anything else they were used for, apart from looking at the Shroud, is extraordinarily scarce. Thank you everyone on this page, as I have now rectified the small mistakes. Please do let me know of anymore. The courtesy rank awarded to Ray Rogers was not an indication that he was a member of the armed forces. It is common practice in secure military establishments to give give civilians who work there an ‘equivalent rank’ for the purposes of security clearance and domestic arrangements. As an explosives expert, Rogers needed to have the access privileges of an officer, and, working with actual officers, access to their dining-halls, rest-rooms and so on. If Simon is still able to correct things, perhaps the ‘Barrie Scwortz’ on the front cover could be spelled correctly, and ‘nothing but, facts’ could be correctly punctuated. On the back cover, ‘Peter Shumacher’ could be correctly spelt, ‘Marino’ could be given his first name, ‘Nitowski’ could be correctly spelt, ‘by Dr. Nitowski and by Kohlbeck’ could be correctly punctuated, and ‘Biblical Archeological review’ could be correctly spelt. Frankly, Simon, the plethora of editorial errors on the covers of your book do not inspire confidence in the contents. Hello Hugh, thanks for the useful info and letting me know about the spelling mistakes. It was also very good to meet you at the Jalsa Salana conference and get to know you. I will also add on my channel your interview I took of you explaining your views on the Shroud. My editor has checked the spelling mistakes out, and said some are not mistakes but are correct and has now rectified the wrong one, thanks. Please don’t let the errors put you of, I always make mistakes, like most people, and people like you always let me know about them, which I always then rectify. And the many mistakes which was on my first Shroud booklet which has been no 1 on Amazon for over 2 years is a good example and proves errors make no difference, after they have been rectified. As I said, I will send you a free copy to let me know of any more, which I doubt you will find as the majority of the book are articles and research by other Shroud experts. The End if Near Who is Addai?